I've always wanted some of the infamous Motel Black and White Jordan jeans, However there is something about jeans just don't sit well with me. I think I just dont like denim, I prefer things that are a little softer to wear than denim. However I saw these leggings on ebay and decided to go ahead and order them! I'm pleased with them, as far as statement leggings go these are about as far as I'd push myself. I absolutely despite the baroque print ones that are ~all the rage~ at the moment! But these are pretty cool. I think with a simple black top they didn't look too much, and I particularly like the way they look with my flatforms! 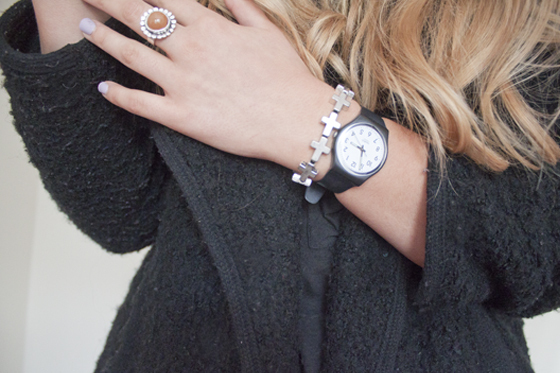 I'm also a big fan of my black tied cross bracelet and my beloved swatch watch at the moment. I go through phases of not wearing a watch and then wearing one, the ticking drives me a little bit mad! Today has been a bit of a write off as I wasn't able to do half the things I'd planned to do. Mainly because after I'd got ready and did myphotos I settled down and started reading blogs, and then one hour quickly turned into two! I did manage to plough through my emails and reply to the questions I know the answers to! I really need to go into central London to take stuff back as I probably have a few hundred pounds of clothes squirrelled away in my bedroom that I need to take back. I keep looking at my bank balance and telling myself to get myself to the shops to return them! Hey! cada ves te vistes mas simple! "Menos es mas!" me enta este outfit! hahah I'm the same, I go on my laptop, look at the clock and hours have past! Love that outfit! I already loved those pants when I saw the Instagram picture you've posted. They're amazing! I really like those leggings! Think I may have to pick a pair up... I know missguided have some great ones in at the moment too :) Nice to change it up from black ones every now and then! omg i love your leggings! theyre so flattering ! Love your hair in these pics Lily. Those leggings remind me of Beetlejuice (in a good way!) and I have just ordered a pair of flatforms after seeing yours lots lately - they got in my brain. Loving this outfit Lily; and your hair looks gorgeous! I have wanted a pair of striped jeans for so long but never felt brave enough, the leggings are a brill alternative and look great! I really love the shape of your top too! I bloody love those leggins! They are so affordable, too! These actually look really nice and I've not 'done' leggings in ages. Hate the baroque leggings too - very chav. Saw some monstrosity wearing them on the bus the other day and it was horrific! They look so good on you, I love them with the flatforms! I love this look and your lipstick is so cute ! I love how you generally stick to monochrome but manage to make every outfit different and eyecatching! Love the leggings, and bargainous price! I really want the motel jeans! I prefer jeans to leggings but love the design! Another gorgeous monochrome outfit - I love how simple it is but yet really stands out at the same time. I have exactly the same problem with my watch, its a vintage one that I have to wind everyday and it's insanely loud so I've stopped bothering to wind it and just wear it coz its pretty, but then when people ask me the time I seem like a complete idiot! In love with those leggings! your hair look looovely. gotta love a bit of stripe! I love the leggings and necklace ! This is a really cute outfit ! Your hair is amazing in these photos :) I think it would be really nice if you let all the blonde grow out! love the leggings so much! love the top and leggings! Love this outfit! The leggings doesn't make it over the top! It looks just nice! H&M has something like the leggings too and the material is something like jeggings? lol. it looks nice though! Need need need these leggings! I've become oddly obsessed with leggings after being terrified of them (I have a large derriere) all my life. These might just have to be next on the list! I love the bracelet! I know what you mean about the ticking... I guess not everyone hears it but it's SO loud, I swear. I LOVE this look. I think its my favourite one that you have posted. Those leggings are really cool! THE SHOES AND WATCH. I like it!!! Those leggings are just awesome. (: Love it. I have the Jordan Jeans, they are super soft and stretchy and not like denim at all, i have 3 diff pairs and they're really comfy (i don't really 'do' jeans either) But i recommend them! Your right, your leggings looks so cool with your flatworms...(lol typo I meant flatforms) there is just something about pairing the two together! Kinda reminds me of beetlejuice or something! Love the outfit! And I am REALLY massively enjoying the ASOS Flatforms... never bought shoes off ASOS - has anyone else? I have wide feet so not sure how big/small people find them? I am also loving the dip dye, I had one done and as they werent sure how consistent the colour would be they dyed the whole undersection of my hair blonde so it kind of peeks out from underneath, but I really love the colour combo Lily has! I am in love with the shoes and the top! Can't believe it's primark! I love the top! Really cute leggings too! I love the shoes and the leggings, great outfit! I absolutely love those leggings on you, they look fab! Also, I want your hair Lily!! This is one of my favorite outfit from you. Plus those leggings look amazing on you! i love how delicately clean your hands always look! Those leggings are far better than baroque. Monochrome is the way forward, I may have to invest. I came on your blog to get the ~ symbol to type into my address bar because i can't find it on my mac keyboard, glad it was in this post! 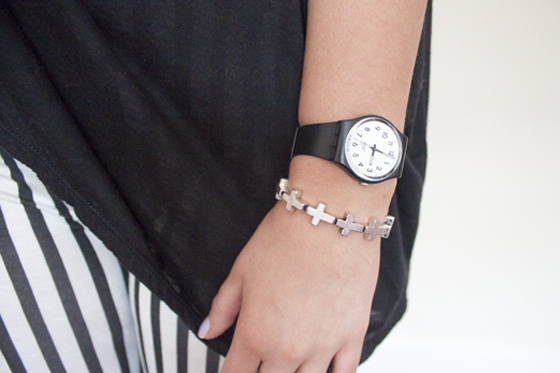 I see baroque print leggings and instantly hear bad 80's music, they just make me cringe :| The cross bracelet is lovely! the leggings remind me of the adams family! i have been thinking of ordering the ones that are black in front and black in back on ebay! you have inspired me! love them shoes! i bought the motel stripe jeans a few weeks ago but these look leggings look gorgeous on you. I have the EXACT same leggings! Think they're from the same ebay seller too. I call them my Beetlejuice leggings! Nice! I agree the baroque print ones are just vom. Looks tacky. Ive got these leggings, I find they fit a bit weird though. Are flatforms easy to walk in ?